A tent is your home away from home. You want it to be a dry, comfy shelter – and you don’t want to have to replace it every year. James Brittain, MEC Senior Equipment Designer, has years of experience creating tents and knows what goes into a quality tent design. What type of testing do MEC-label tents go through? Plenty. 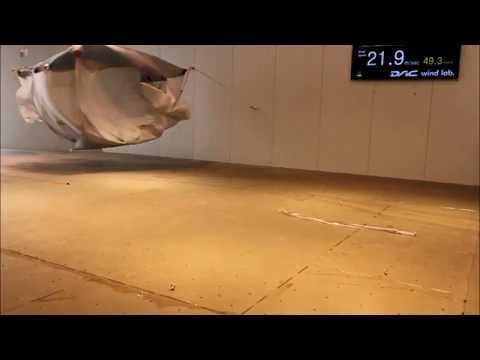 The video above is just one example, and it shows the MEC TGV Tent being tested a special wind lab (we learned a lot about the best guyline placement with this test). We also have our own materials lab for testing, and send tents out into the wild for field testing to make sure they’ll stand up to the conditions they’re designed for. Make sure the tent you choose is up for whatever you expect nature to be throwing your way. A good sealed seam can withstand a downpour and won’t be compromised by the hot sun. MEC tent seams are sealed using techniques similar to the ones used in our waterproof GORE-TEX jackets. Another thing to look for is a full-coverage fly that comes down to the ground (cheaper tents don’t typically have this). Combined, these features will keep wind-blown rain off your tent from all sides to keep water out, with no extra tarps required. Make sure there’s space between the fly and the canopy. You want air to be able to circulate through with venting in the right places, otherwise condensation from your breath will settle on the tent walls overnight as you’re sleeping. Think about how many times you zip and unzip the front zipper – it’s like your front door when you’re camping. The front zipper takes a lot of abuse and can often be the first part of a tent to fail. Look for heavy-duty zippers (MEC uses the industry leader YKK) and test them out to make sure they don’t stick or snag. Aluminum is both lightweight and sturdy, which makes it an excellent material for tent poles. Fibreglass poles can break, and steel is heavy and bends without bouncing back into shape. Quality tent pegs won’t break or bend when you hammer them into rocky ground (or when you hammer them with a rock into rocky ground). When you can get the pegs set solidly in whatever surface you’re camping on, it means your tent will stay put, and it will do its job, which is keeping you comfy and dry. Look for tents that can be assembled by one person – it’s especially helpful if you’re family camping, because one parent can set up while the other one keeps an eye on the kids. MEC tents use instructions that are image-based, simple, and they’re printed right on the carry bag, so you won’t lose them. They’re not always must-haves, but extra features and tent add-ons can make a difference. Things to look for include big vestibules (sometimes sold separately) or awnings that give you a place to hang out if it’s sunny or rainy. Inner pockets are helpful to stash your headlamp and other small items, and gear lofts act like mini attics to store items out of the way. Divider curtains, multiple doors and built-in lighting can also make your tent feel like a well-designed outdoor home. What tent should you buy? The features above are a solid starting point when you’re tent shopping, but the best tent for you depends on how you plan to use it. If you’re looking at backpacking tents or winter camping tents, you’ll likely have different requirements than someone who wants to find a family camping tent for their crew. To help you decide, check out how to choose a tent. Along with the MEC tents that James designs, there are also lots of other tent brands and designs to choose from, such as MSR, Big Agnes, Therm-a-rest and many more. Most MEC stores also offer tent rentals, which is a great way to try different tents and see what features work for you. MEC Senior Equipment Designer and Mitsubishi Delica owner. Frequently on the road (for work and play), he has a refined British-junk-food palate.